LaVida Health is committed to encouraging and guiding you to good health through our naturopathy services. Yoga could be a wonderful addition to your routine to help you achieve your health goals. We are often talking to our clients about the benefits of relaxation, meditation and exercise, so what better way to incorporate all three than with a regular yoga practice under the expert guidance of our qualified yoga instructors. Yoga is a fantastic way to build strength and flexibility as well as calm the mind and calm the nervous system. Our yoga classes offer a friendly and relaxed space for you to practise. We have a limit of 9 students per class to ensure you won’t feel cramped or boxed in by those around you. And as safe practise of yoga is important to us, the small class size also means you are provided with individual attention so you can be confident you are moving safely through the postures. Our classes are open to everyone (you don’t have to be an existing client of LaVida Health). Vinyasa Flow is a dynamic class which moves through a combination of yoga poses in time with your breath. By doing this, the yoga practice becomes more fast paced than our slow flow classes and is great for creating space in your joints, building strength and improving flexibility. Your yoga moves will generate some internal heat, however, rest assured this is not hot yoga. Vinyasa Flow is not just about the postures though. Time for pranayama (guided breathing practices), relaxation and meditation is included. Our Slow Flow class is a great way to de-stress and move your body without getting all hot and sweaty. This class offers a combination of long-hold poses and short flow sequences providing gentle stretching, strength building poses and relaxation exercises. This class is perfect for getting your mind focussed on your body and calming your nervous system. Join us for a weekly pregnancy yoga practice designed to meet your physical, emotional and spiritual needs as you move through pregnancy. Discover your strength and learn to trust your body and your instincts during pregnancy in preparation for birth and motherhood. Take time for yourself to connect with your growing baby and connect with other mums in a relaxed and small group setting. Suitable for all yoga levels and throughout pregnancy. (Note: You are welcome to attend this class without being pregnant. Just be aware that the focus of the class is around pregnancy and therefore the class is designed to support the pregnant body). Yin is the perfect compliment to our more challenging and dynamic classes such as the Vinyasa Flow. This style of yoga targets the connective tissues that are not normally stimulated during the more active styles of yoga and is a passive practice, meaning you are rarely standing. Yin yoga uses lots of props and holds poses for up to 5 minutes. Sometimes even more. This results in the body getting a deep stretch which is challenging in its own way. It’s a great way to relieve tight muscles, especially around the shoulders and hips. All of our classes are done at ambient room temperature (i.e. they are not hot yoga). Mats and props are provided (but feel free to bring your own if you prefer). Just dress comfortably and we'll take care of the rest. Our class sizes are small to facilitate individual attention, in a friendy and relaxed environment with beautiful views over the river and Southbank. We offer different types of classes, a range of pricing options, and our Yoga Rewards program. When you reach 500 points you will be able to redeem $50 off your next purchase and you have 2 years to use your points before they expire. So, for example, if you come to a class once a week, you will earn your 500 points in approximately 6 months (even quicker if you refer one or more new clients or come to more than one class a week). Walk-ins are welcome but if you want to guarantee your spot, bookings are encouraged. To book classes please visit our booking page or call us on 03 9620 9503. Otherwise, just come along and we look forward to seeing you in class! 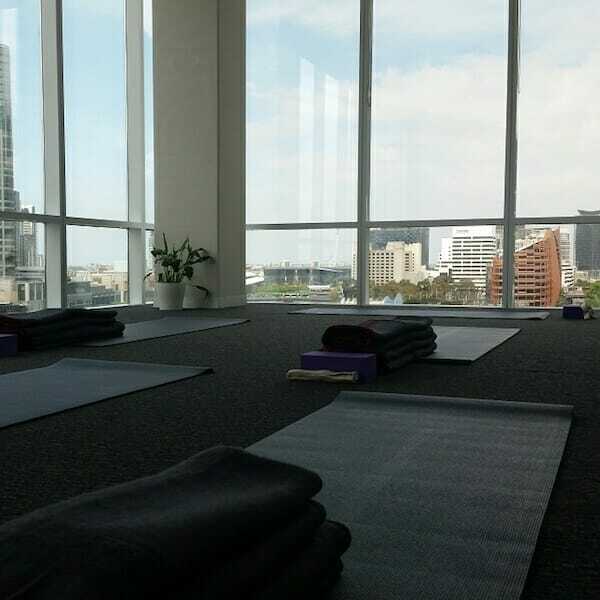 Want to book a private yoga class for you or your group? If you have a small group (maybe a work group or just a bunch of friends) who would like to do a class together, we can organise a special class just for you. It might be as a team reward or to celebrate a work milestone or it might make a nice change for a birthday or get-together. We also have teachers available to teach one-on-one yoga classes at a time suited to you if that is your preference. Just call us on 03 9620 9503 and we can work out a time to suit you. (NB: space limited to 9 people).